Buying a laptop is sometimes a big hassle. There are many models on the market, many of which offer similar standards and their prices do not have any special differences. Having the ability to upgrade a laptop could be a great asset. Laptop upgrades are more than often reduced to Ram battery and hard drive. Our first move is to check whether our laptop is upgradable. So, we thought we’d try Crucial. Crucial is a company specializing in memory upgrades and hard drives for laptops for several years now; it guarantees high-quality results as well as product compatibility depending on your model. The process is quite straightforward. For this article, we chose an original Dell model, Inspiron 15 3576, with the minimum equipment available. Our first move is to choose the Crusial Advisor Tool. Here we can manually locate the model that we are interested in or if we already have it, to choose the Scanner Tool. In the context of our article, we chose the latter- Scan Computer. Now, we will be asked to download and run a small Script ID that will scan our computer to identify the Hardware ID. As we can see, it managed, in less than one minute, to locate the model and give us the features we want. The 4 GB of RAM do not do justice to our Dell, which came with an eighth generation i5 processor and cost less than 500 €. Noticeably, we have the ability to upgrade it directly as it comes with two slots. Factory memory occupies one Slot, while the other one is free. We also see that the motherboard for this model can support up to 16GB of RAM. Below the image that recognizes the Laptop model we tested, we have a list of options, at pretty good prices, with all our compatible solutions for memory and hard drive. This phase, though, was concerned with RAM only. 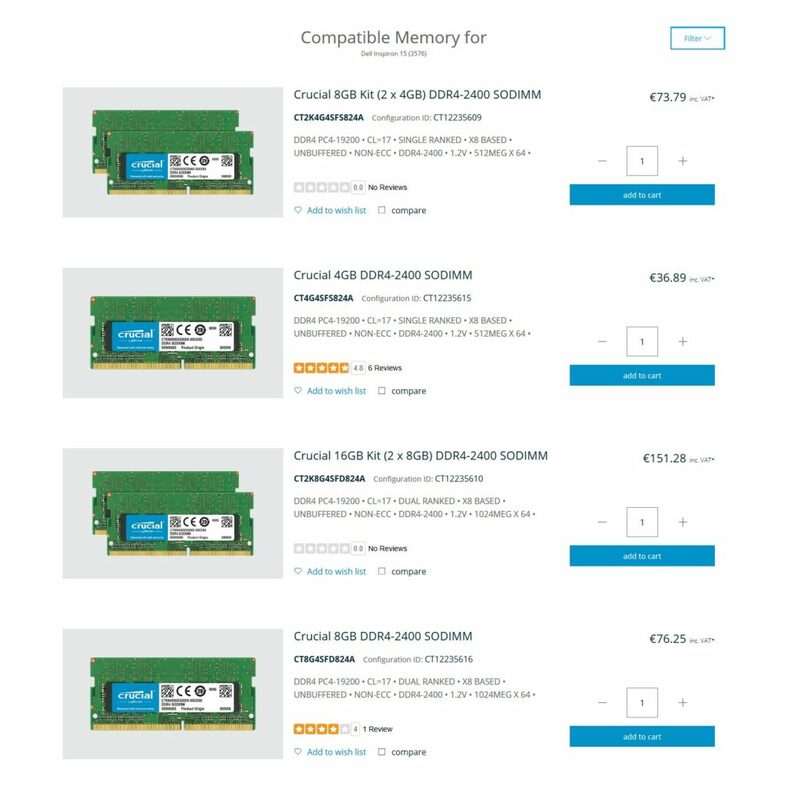 Paying an amount of just 36 € can get our computer upgraded to 8GB RAM. Delivery took place very quickly and we simply put the new memory into the empty slot. The computer recognized it immediately, improving the user experience. Crucial gives Life Time Guaranty for memories. If a compatibility problem occurs, you can be fully reimbursed within 45 days from the delivery date. We have not yet faced this problem, so we consider Crucial a fairly secure and affordable solution. Traveller, writer, curious about how things work. Usually on the road with a MacBook and a camera.